I had forgotten how miserable a head cold could be. There was so much mucous I started to wonder if it was coming from my brain. The simultaneous stinging and pressure inside the sinuses on my forehead was amazing. I knew it would eventually pass as my throbbing head abated any possibility of sleep. Since my wife is sensitive to the sound of a long rolling snork (and the slurping of soup), I elected to sleep in the other bedroom, which prevented a 911 call. It may sound strange but it is normal to get sick. You come in contact with a virus that enters your body through your eyes, nose, or mouth. Sometimes you get sick and sometimes you don’t. What if you never get sick or if you get sick too often? This may indicate a problem with an under or over acting immune system. What if you get sick and just cannot shake a cold. Antibiotics are of no value if you have a virus. 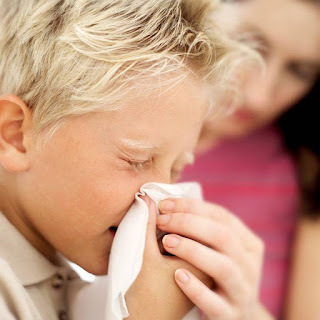 However, may times a viral infection such as the cold or flu may turn into a bacterial “infection”. A great example of this is “Strep Throat”. You get a viral infection, your tonsils (part of your lymphatic system) excretes fluid in an attempt to detoxify which is like opening the grocery store for the normal Streptococcus bacteria in your body. Yes, Strep is part of your normal bacterial flora. If you take an antibiotic the strep will be killed OR if your body is able to clear the problem, the secretions are minimized, the grocery store closes and the bacterial count naturally diminishes. Any stressor can make you more susceptible for a virus. Stressors include anything that puts you out of balance. This includes the lack of good water, food, exercise and rest. It may also include any toxic load (see detoxification blog 1 thru 5) or emotional upset. This is where a proactive approach to wellness is so important. TAKE CARE OF YOURSELF FIRST! The helpful remedies for a cold include lots of water, homemade chicken soup, and rest. I take Influenzium 1M monthly as a viral preventative. You can also take Colostrum to boost immune function. Probiotics such as Enterobiotic SBO can be helpful. Homeopathic Sinus HP is great for head congestion. Vitamin C can also be helpful.